In 2012, I played the best poker of my life. I captured my record 13th bracelet as well as 1,022,376 EURO in first-place prize money. I invite you to join me with 2-time WPT Champion, Jonathan Little, as I give you the details to my spectacular win. 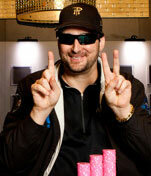 Click here to enjoy (and learn from) Phil Hellmuth’s one of a kind poker mind as he analyzes a key hand that he played in his 2012 WSOPE Main Event win. Phil spends 9 minutes breaking down this amazing hand with Jonathan Little in his Webinar “How I Won the WSOPE Main Event,” a three hour course available for a limited time for $99. Visit PokerBrat.com to check it out. Enjoy limited time discounts while you are there.